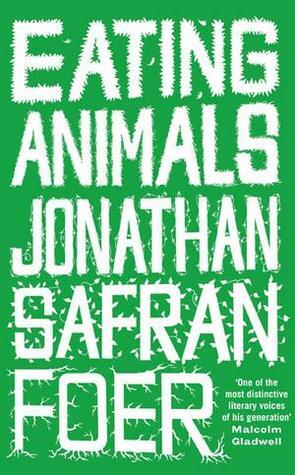 Eating Animals by Jonathan Safran Foer was a book that I'd heard about years ago, starting reading last year and only finished early this year. It's a book about animal welfare, animal cruelty and the morality of eating animals. I found it fascinating. It was definitely a book that was difficult to read, but it feels like an important book to read as well. I'm really glad that I have. 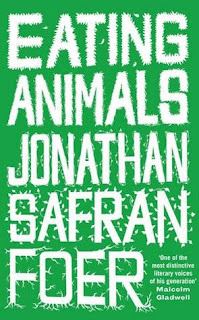 As I said, this book is a non-fiction book written by a well-known literary author, Jonathan Safran Foer. He spent several years researching this book after pondering the idea of how moral it is to raise, kill and eat an animal for the food. As well as having quite a lot of facts in this book (there was at least two pages on my Kindle that listed all the sea life that is harmed or endangered from modern methods of farming fish for food consumption!) there is also some thoughts from the author himself, extracts from people in the farming communities, protesters against factory farming and a really wonderful narrative about eating as story-telling that ties all the different threads of this topic together. I think the facts speak for themselves on this one. I think most sensible people will realise the harmful impact of factory farming on the animals themselves, pollution etc. But I think the extent of the harm is what is eye-opening about this book. To me, at least. I knew that things were bad, I didn't realise how bad. Or perhaps I was just entirely disinterested in knowing and thus didn't look into further because of how much I enjoy eating meat presently? I think the latter is more likely the case. The author delves into the welfare of animals currently being factory farmed, predominantly in the US but he brings up in the text that practices are no better in other countries such as the UK. The lives and deaths of chickens, pigs, fish, turkeys and cattle are in the main spotlight in this book. But also the economic reasons for factory farming, detailed accounts of what the different farms for these animals look like, what the lives of these animals consist of. It also looks at a handful of farmers who are trying to be more compassionate in the ways in which they farm animals. The facts portion of this book made my stomach clench, my conscience kick in and it had me seriously considering vegetarianism. There was also a large section of information regarding the spread of disease that is caused by factory farming and information regarding the extent of pollution. But I think my favourite aspects of the book revolved around eating as a means of social culture and the thread of story-telling and our eating practices. I really loved these parts of the book and I could really relate as well. I think what we eat, how we eat, who we eat with are definitely areas that shape our identities which means making large changes in our eating habits difficult for a lot of people to do. Though the author himself, after doing the research for this book, admits to becoming vegetarian himself, it isn't his aim, I don't believe, to advocate for readers to turn vegetarian themselves. He seems to want to bring the facts to life and is really advocating for better, more responsible choices in terms of animal welfare and well-being. I really found Eating Animals to be an engrossing, thought-provoking and emotional read. And I, will definitely be considering my eating choices in the future based on the facts provided to me here.